The Green Valley Park, with an area of approximately 25 hectares, is situated on green hills, in the midst of unspoiled nature, around the old town of Stárkov. The park is located near the Teplicko-Adršpašské Rock area in the unique nature park of Broumovsko, not far from the Polish border. Stárkov has a beautiful environment, not only because of the nature, but also because of the numerous cultural sites you will find here. 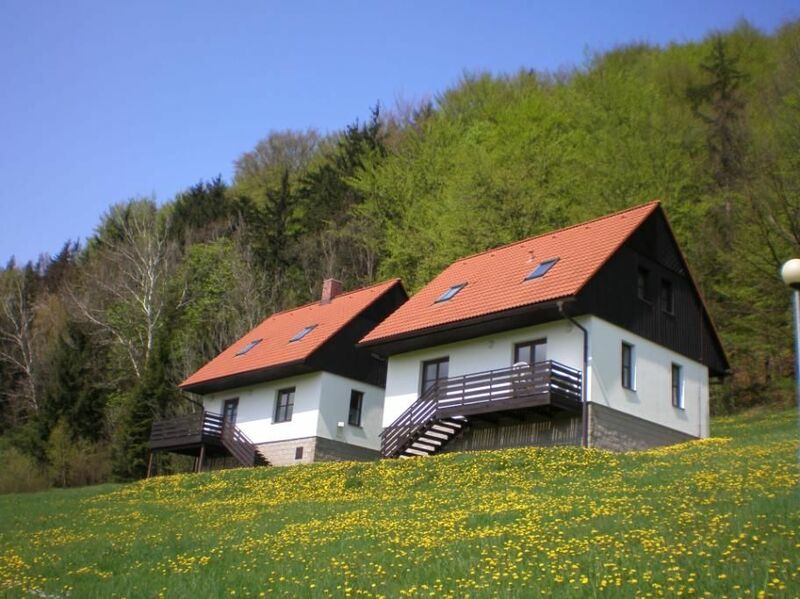 The holiday villas are modern and solidly built in Czech style and offer western luxury. The apartments are fully and luxuriously furnished and are located in a sunny area. The park has a variety of facilities including a restaurant, a game room with snooker and darts, a riding ring, fishing pond, miniature golf course with a garden, a trampoline and lots of grazing animals. On the terrace of the main building and in the café you can use free WiFi. You can use Wi-Fi internet also in the villa for a fee (8 euros / week). For the little ones there is plenty of oppornity to have fun. On the ground floor (100 m2) there is a living room with a comfortable seating area, doors leading to a furnished terrace, a satellite TV (with foreign channels) and in some apartments, a wood-burning stove or fireplace. Wood for the stove or fireplace is availabel for a fee. The luxurious, semi-open kitchen has a dining area, 4-burner electric hotplates, microwave, coffeemaker, kettle and a fridge. There is a large bathroom with a sink, shower and / or bathtub. There is a separate toilet. On the 1st floor there are two bedrooms furnished with two single beds. The third bedroom has a double bed. In some accommodations there is a second toilet. The villa has electric heating. In the villa you can use Wi-Fi internet for a fee (8 euros / week). NOTICE:The tariff for gas/water/electricity. For energy are fixed costs calculated. In this park there are many options for entertainment, so that no one will be bored: a riding ring, miniature golf and a childrens playground with a swimming pool, trampoline and fishing pond. The barbecue and campfire are suitable for a culinary festival, while the 'Lorna', a Czech feast featuring chicken, chops and sausage, is prepared on the open fire. You can also bowl, play golf or engage in a number of other games such as football, darts, pool or table tennis. There are organized horse and carriage rides (if there are a sufficient number of participants) and once a week there is a trip to Prague. For groups of 15 to 20 persons there is the possibility to book a golf or yacht package. In the park you can rent bikes to explore the surroundings. You can swim at the lake of the park. A tennis court is 500 meters away and for 'racers' there is a go-kart track 4 km from the park. - Tips for day trips: swimming and water sports at the sport center in Rozkoš, the heated outdoor pool in Trutnov, or the covered swimming pool in Polish Kudowa Zdroj. Hiking or climbing is possible at the Adršpach National Park with its rock formations. With the children go one day to the zoo and safari park in Dvůr Kralove nad Labem. For lovers of culture and history there is the imposing monastery complex in Kuks Broumov. Still to recommend: the Giant Mountains (Krkonose), the Christmas manger in Třebechovice, the aqua park in Hradec Kralove, or a visit to Poland with its Kudowa Zdroj resort, Gor Stolowich National Park and Polish market.